Another project, Nyack Point Apartments is already completed and it offers affordable studio, 1 and 2 bedroom apartments. 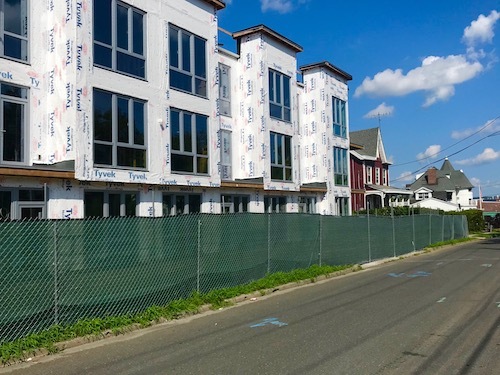 Another project, The Montclare is just up the block and is well under way and is slated to open summer of 2019. This will most likely be market rate rentals. Probably one of the biggest projects is also well under way is the Pavion Apartments which will sport a clubhouse, a pool, and an incredible downtown location. These will be 1 and 2 bedroom apartments with large windows and I think some of the apartments will have river views. The developer is shooting for early 2019 opening. Rental prices will be somewhere around $2200 for a 2 bedroom. Lastly what used to be the TZ Vista project is now called Tidewater. This project will sit at the foot of Main Street on the river and will be luxury condos with public access to the river. It is still going through some environmental and engineering issues, but the developer says that are looking at a September start. We have a lot going on and all these projects suggest that Nyack is still a very desirable place to live , and be single, raise a family or to retire. This influx of people should make the downtown business district expand and flourish and maybe even slightly reinvent itself . Depending on how you view these changes this could be a good or bad thing.